We are now accepting applications for the second Zotero trainers workshop, to be held July 30-31st at Emory University in Atlanta. At this info-packed and fun-filled two-day event, participants will acquire a solid understanding of Zotero’s capabilities and how those capabilities can best meet their users’ needs. Beyond acquiring a detailed understanding of the program, participants will learn: best-practices for demo-ing and supporting Zotero at their institution; approaches for developing institution-specific documentation; and steps for migrating user data to and from other research management tools. The first workshop was held at George Mason University in Fairfax, VA and drew a diverse group of public and university librarians, faculty members, and educational technologists. Participants hailed from institutions as far away as Seattle and backgrounds as diverse as law and the humanities. Whether or not you can attend the workshop, consider joining the “Zotero evangelist” Google group, which sustains an ongoing conversation between workshop participants and other Zotero trainers. 3. Maximum representation of different campuses: we will most likely only accept one or two individuals from any single institution and are seeking representation from a range of schools. Application details and forms are located here, and applicants will receive confirmation of their acceptance by June 10th, 2009. Applicants not accepted to this workshop will be welcome to apply to the next one, planned for fall 2009 at the University of Washington in Seattle. More information regarding this and later workshops will be released as available. New Support for Other Browsers! 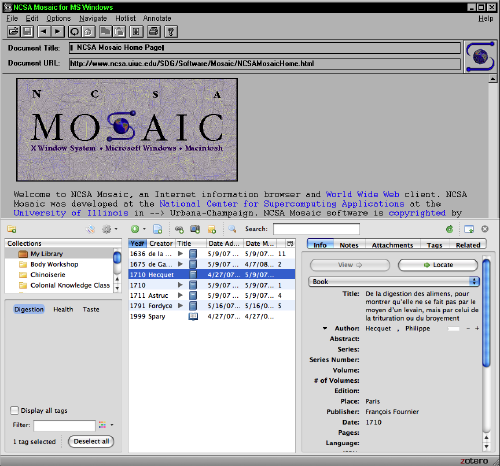 Co-Director Dan Cohen stated that the Mosaic release, code-named “Zotero Classic,” was only the first step in toning down the “next-generation research tool” rhetoric that has dogged the project from the beginning. He revealed that the next release, known internally as “Zotero Graphite,” would involve interns, pencils, and possibly a fax machine. The Zotero team expects performance to improve dramatically with forthcoming support for Netscape Navigator 1.0. “I’m thrilled about replacing Zotero’s sqlite backend with blink-element-powered Morse code,” admitted Lead Developer Dan Stillman. Within ten years the team expects to work its way through every browser ever created. “Of course by then, computers will be so expensive that only the five richest kings of Europe will own them,” suggested Community Lead Trevor Owens. Posted in News | Comments Off on New Support for Other Browsers! You are currently browsing the Zotero weblog archives for April, 2009.